A few months ago, Uber started facing the heat when it started tracking users everywhere they went. After facing much criticism from all sectors of the public, Uber has decided to revert its policy to track users after a trip has ended. 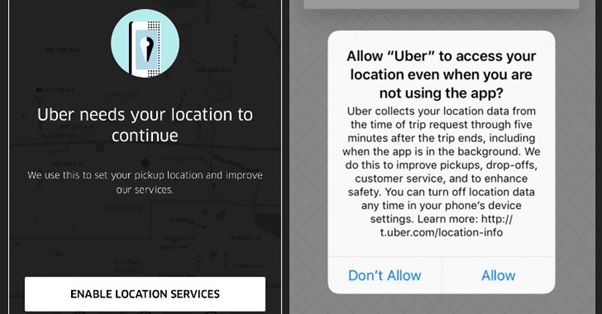 The update in November forced the users to either choose to let Uber collect their location data at all times or to disable the feature completely. Choosing the latter option would mean that the user had to enter a pickup or drop off location manually, hence degrading the user experience. Enabling the feature meant that the app would keep collecting the user’s location data for five minutes after being dropped off. Prior to the update in November, users were only tracked by Uber when the app was in use by them. The Chief Security Officer (CSO) of the company, Joe Sullivan, said that the company’s decision was rolled back because it couldn’t give a concrete clarification of the values it intended to promote among its users by letting the app track it after the ride had already ended. The company owned its mistake by saying that the initial aim of the company was to ensure customer’s physical safety, but the way they pursued it was wrong. The CSO further told that if the company was to re-introduce the feature, it would do so by clearly stating its purpose to the user and by providing them the option to opt in. He also claimed that iPhone users were not being tracked post the trip by the company and the feature shall now suspend to exist for Android users as well. A new update to the app, which will scrap post-trip tracking, shall be available to iPhone users this week and to Android users in the following week. Mr Sullivan ensured that the company will continue to improve its performance by making advancements in its privacy, security and transparency.